Whilst we have mixed feelings about diving with sharks that are attracted due to human interference i.e. bait, we often receive email enquiries about where to do cage diving with Great White Sharks. Here is our guide to the basics of shark cage diving. Diving with sharks from the interior of a cage is perhaps the safest way to interact with these primitive creatures. While the rules of cage diving may seem obvious, following a few simple steps will greatly increase one’s enjoyment of the activity. 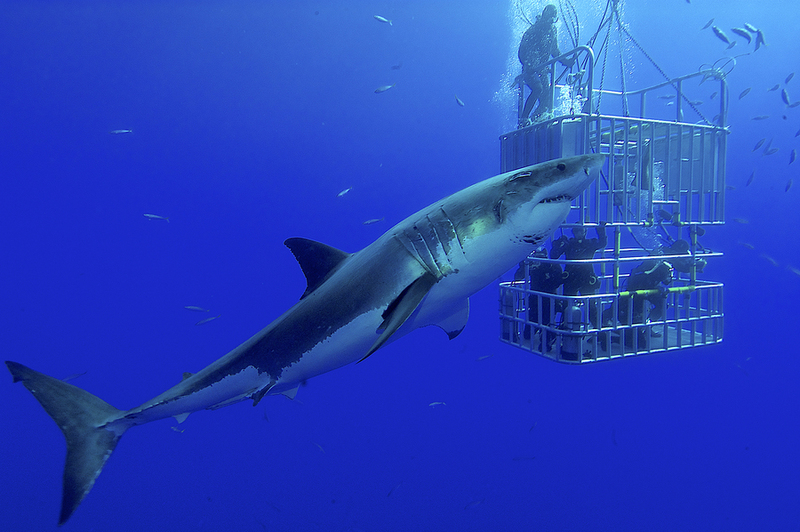 Whether in Australia, Mexico or South Africa, these are some of the rules to ensure the best cage diving experience for you, the shark and the others in the cage. Never book with an operator whose reviews lack recent and constant praise, there are those, especially in Hawaii who have recently come under scrutiny for illegally feeding sharks, baiting them in areas close to high human populations, and furthermore disrespecting ancestral and religious beliefs by feeding sharks at all. In White Shark hotspots such as Gansbaii and False Bay in South Africa, there is often an abundance of operators in the same town. Don’t feel pressured to book online before you arrive. Especially in low season it can be beneficial to visit the respective outfits, speak to the staff and understand their logistics as well as the details of the tour. Many tours are different, whether that be the price, length of the day, the number of people on board, the food and beverages supplied or even the structural integrity of the cage. All these points are valid when considering which trip to take. For example, waiting on a boat in poor weather while others queue enter the cage can ruin the entire experience. It seems clear, yet when on-board the boat be sure to take seasickness pills if you are usually prone to the condition. Many White Shark hotspots such as Australia and South Africa have rough seas throughout the season and long journeys to seal colonies and hunting grounds. Before preparing to enter the water it is important to make sure you have brought or renting a wetsuit that fits and keeps you warm. The water temperature in South Africa can often fall below 15 degrees, furthermore, the waters surrounding Neptune Islands in Australia rarely rise much higher than that. The majority of cages will be attached to the back of the boat on the surface where the top hatch will be opened and 2-4 people will be helped into the water. Most of the cage will be lowered under the water allowing people to hold their breath and look under the surface between the bars as the sharks are approaching. Liveaboard boats that operate in Guadeloupe Island off the coast of Mexico are famed for submerging their cages to depths of 10 metres (30 feet) which means that tourist have to be qualified divers. Viral videos depict people often hanging their limbs outside of the cage attempting to take better images without the bars of the cage. While tempting for many, the risks are to numerous, especially when the shark is close and feeding on chum that is thrown into the water close to the cage. Try to always keep eye contact with the sharks, a surprise bump of the cage can be as scary as it is exhilarating. Interested in finding out about where to dive with sharks in Australia?